We have been living in a low-volatility world for a while now, driven by a massive alphabet soup of central bank liquidity which has been delivered globally. If it’s not the Fed engaging in QE’s 1, 2 and 3, it’s the ECB’s PSPP and CSPP bid, BoJ’s QE and yield curve control, or simply the massive stimulus delivered by the PBoC. But the persistence of low volatility and low yields is also thanks to what seems like a Goldilocks global growth picture. The US economy has put in a sufficient recovery over the last year such as to allow the Fed to have hiked three times without much ado from the markets. Similarly, European growth hasn’t been that stellar since the Eurozone sovereign crisis, which put most of the continent into a coma for the last five years. And of course, against all devaluation expectations, the Chinese Yuan and economy have both charted a firm and steady course so far this year. Put it all together, and you have a global economy probably past its peak but not yet falling over, and activity levels that are holding up but not so strong as to warrant a sharp rise in interest rates. But what lies beneath may not be so Goldilocks. The economy is both ‘too hot’ (US labour market) and ‘too cold’ (global inflation), and it is precisely such opposing forces that currently result in a benign macro backdrop. In the tug-of-war between a Fed determined to pursue monetary normalisation and a stubbornly weak (or at least weaker than-expected) inflation picture, the yield curve has flattened and low-flation has won. Certainly after five disappointing US inflation prints, a belief has set in that we are now in a structurally lower inflation world, perhaps as a result of the success of inflation-targeting central banks. It was only 18 months ago when the world was convinced that the US was headed into recession. By the start of 2016, WTI crude oil had found new lows in the mid-$20s, US GDP growth had more than halved in less than a year, and ISM PMIs were firmly in contractionary territory. Between mid-2015 and early 2016, US high yield credit spreads had almost doubled to 6 per cent. Concerns over the US being ‘late-cycle’ had quickly escalated into fears of the next US recession, and no investor wanted to touch US retail with a ten-foot barge pole. Then, in what felt almost like an overnight move, things started to improve. We all know very well by now that the Chinese credit stimulus of late 2015 ‘made America great’ by delivering the impulse needed to avoid the next dip. Soft and hard data based as commodity prices lifted off their lows, and however late-cycle the US might have been then, the economy had once again peered over the edge but stepped back from the abyss. Asset volatility, risk premia, and credit spreads globally followed the US recovery, and the rest is history. BTIM Portfolio Manager Amy Xie Patrick comments on the reasons behind, and ramifications of, the recent strengthening of China's yuan. 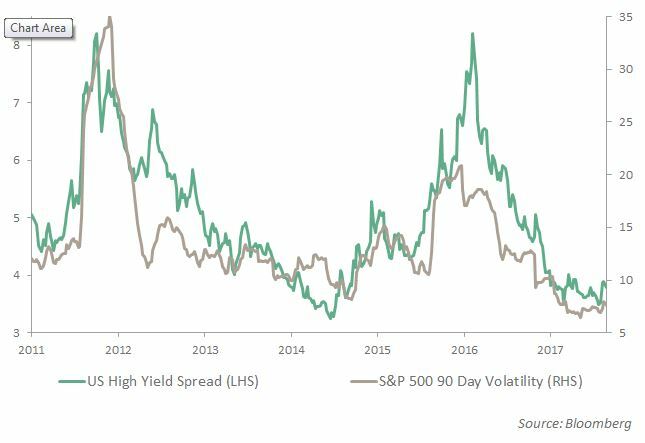 In our latest update on the high yield sector, Vimal Gor warns that we may have just seen the first signs of our predicted unravelling. BT Investment Management has been awarded Fund House of The Year 2014 – Australia in AsianInvestor magazine’s Regional Investment Performance Awards.